While I had the bike up in the stand, I checked the chain and found it to be 0.75% stretched. I also found the cassette to be quite worn, and even the chainrings were looking slightly worse for wear. This is a result of riding though the winter.. although I’ve been very thorough with cleaning, degreasing and oiling the drive train after each ride, this is pretty inevitable when the conditions have been as muddy as they have. 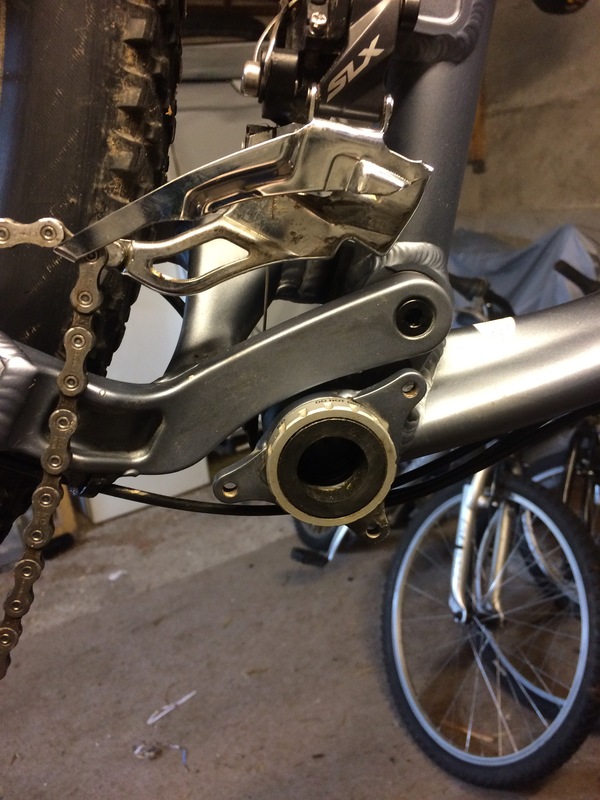 I bought a new cassette (Shimano SLX) and chain (SRAM 1031 – the only 10-speed chain they had) from Halfords, and fitted them today. In terms of the chainset, I’m undecided on my strategy. I’m pretty sure I don’t want to go for a 1x setup as I don’t think I’ll get a high enough gear for the riding too / from the trails I do, and the odd jaunt up the Downs Link Trail. So my options are to move to a 2x or stick with the existing 3x. I wouldn’t really have been thinking about this were it not for the massive trend in 1x, so it’s an interesting quandary. So I need to decide whether or not converting to 2x would be change for changes sake. Incidentally, Halfords branches (well Shoreham at least), will price match their web prices. The website, in turn, has a web competitor price match active. I therefore managed to secure a £24 saving on in-store prices buying the cassette, chain, and some electrolyte tabs, simply by checking the prices on the Halfords web site.. a great saving, and well worth checking before purchasing from a branch. 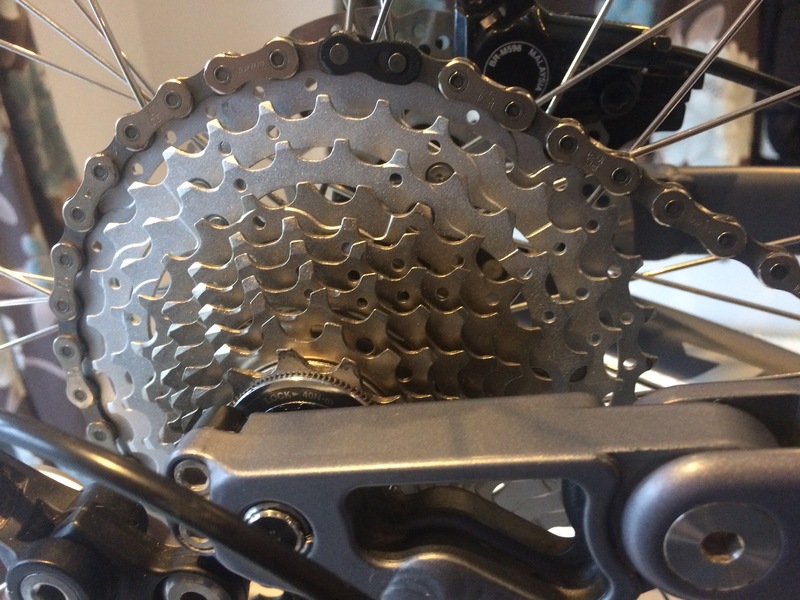 D found out as he pulled his bike from the shed that he had a broken spoke on each wheel, with associated buckles, and a slow puncture – casualties of the Stamner ride last week. So we cancelled the planned Downs ride, and I decided instead to smash out a seafront training ride. Ended up doing a 22 miler, 11 miles along the coast towards Brighton, and back again. Nothing special, but it meant that at 1 hr 25 mins, it left me with some time in the afternoon to give the Kitsune some attention. I’d been having a very much intermittent issue where if I’d stamp down on the pedals, sometimes I’d get an evil sounding clunk. So I removed the cranks, and re-greased the axle and re-fitted. This gave me a chance to give the harder-to-reach parts of the frame a really good clean. Having had my first decent ride since flipping the stem on the Kitsune, I can conclude that doing so achieved the main goal of reducing the reach on the bike. One slight side effect was with climbing – I noticed it was much harder to keep the front end down. This is something I’ve been used to on my other bikes, so is a worthwhile trade off – I’d much rather be pain free and sorted for the flats / descents.